When you’re weighing out your church pew options, you have to consider quality, style, and also what you can afford. Born Again Pews provides high quality pews at a lower cost than our competitors because we believe the mission work you do with your church is the most important thing you could do with your money. That’s why we strive to keep our quality high and your costs down. Unlike some of our competitors, we never use veneers in our church pews. While a salesman will tell you veneer is better than solid wood, listen to your instincts. If veneer is damaged, there isn’t a whole lot you can do to repair it. A chip will be a glaring problem and might even undermine the construction of the pew itself, slowing eating away at the low quality wood “protected” by a veneer. Solid wood, on the other hand, doesn’t warp or twist like salesmen will have you believe. Think about your family furniture that has been passed down for generations–all of those pieces are solid wood. When a solid wood piece gets scratched or damaged, you can buff or sand the damage out and simply refinish the piece and it will look as good as new. Another thing to be aware of when choosing foam padded church pews is how thick the foam is. Most other companies only use 1 1/2″ foam and very minimal lumbar support, compared to the very thick and durable foams we use for padding. You want your church pews to last a long time and thicker foam will facilitate that whereas thin foam will wear thin quickly and leave you sitting directly on a hard slab. 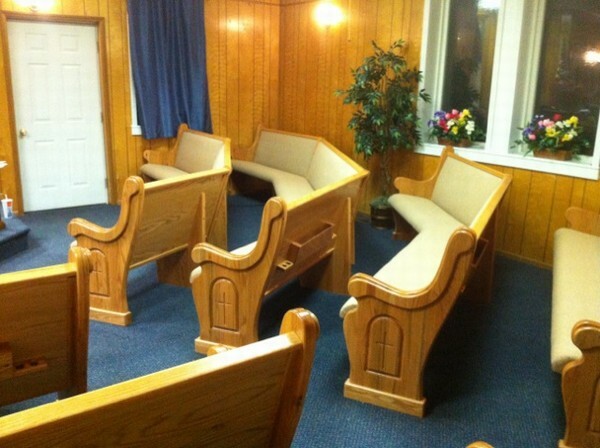 The final thing you should know about our pews is that we never use particle board in our church pews. Particle board is not as strong and durable as plywood, which is made with sheets of wood sealed together with grains running against each other. Particle board, on the other hand is made of wood chips sealed together. Because particle board is made up of thousands of tiny shards of wood, they’re not very strong and absorb water and humidity easily leading to expansion and cracking. We also use 3/4″ thick plywood, which is the standard for sub flooring that you walk on in your home, because it’s highly durable and can withstand years of use. These high standards for materials make a difference in the finished furniture.